Hurricane Irma Jose Maria attack Carribean and the U.S. Message from God? hurricanes to attack the United States. Does God use Hurricanes to send a message? Conflicts, climate change cause rise in hunger. 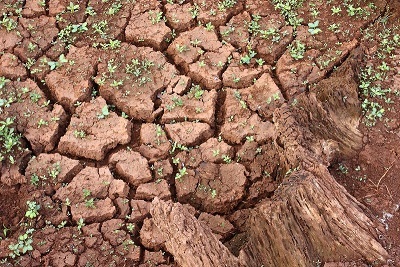 Cracked earth caused by drought. Does God use Hurricanes to send a message to all Americans? I was surprised to find that Google returned about 14.3 million hits! The Salt Lake City Tribune for an an article they posted by Kimberly Winston of the Religious News Service. She noted that for previous hurricanes, some pastors blamed God's reaction to the "homosexual agenda." Howeverm she noted that many religious leaders' reactions to Harvey delt with positive news stories: praising Houston's first responders and citizen volunteers. "We must be very careful before we make divine pronouncements about hurricanes and other natural disasters, as if they were specific acts of divine judgment against specific sets of sinners." "... very little traction” outside conservative religious circles. ... the secular world finds explanations like ‘God wanted to punish Houston’ ridiculous." "God is in control of what is going on, and whether or not Irma is going to do $200 billion worth of damage in Miami ... is all in the hands of God. Those winds are going to blow where they are going to blow, but they’re going to blow in the direction that God ordains them to go. Friends, God is in complete control and utter control of what is going on with these hurricanes. ..."
Last year about 11 per cent of the total human population (approximately 850 million people on the planet) suffered from daily hunger, according to a recent United Nations report on the state of food security and nutrition in the world. This is a tragedy no matter how you look at it. The numbers show a 4.5 per cent increase — or 38 million more hungry people — from the previous year. This rise in hunger is especially significant because it is the first rise in global hunger we have seen in more than a decade. Though global hunger was at 14 per cent of the world’s population in 2005, each year since then, between 2005 and 2016, the number of hungry people on the planet dropped. Development officials were cautiously optimistic that we were on our way to eradicating hunger. Conflict and climate change are the culprits behind this year’s rise in numbers. According to the United Nations, food security worsened across major parts of sub-Saharan Africa, Southeast Asia and Western Asia. For instance, South Sudan is mired in conflict and experienced a major famine earlier this year. If you overlay a map of the world’s conflicts with a map of the world’s worst food security problems, there is a clear connection. The UN notes 20 million people are at risk of dying of hunger not only in South Sudan but also Somalia, Yemen and the northeast tip of Nigeria. All of these areas are affected by conflicts that undermine people’s ability to feed themselves. Similarly, deteriorating environmental conditions have ravaged many of these areas. The UN report notes that Afghanistan, the Central African Republic, South Sudan and Yemen all experienced bad floods in 2016 while Iraq, Somalia, South Sudan and Syria all suffered bad droughts. What we are probably witnessing is an interaction between deteriorating environmental conditions that help exacerbate already existing social tensions and undermine the livelihoods of millions. We’ve been here before; history shows us that there are often links between conflict and bad weather. For instance, there is a complex but well-established connection between droughts and the start of the Syrian Civil War. It seems that faltering rainfall in the early 2000s upended Syria’s rural communities and brought people into cities where they began protesting political corruption in the Assad government. Similarly, there is a link between droughts and the Rwandan genocide of the 1990s. And if we look further back in time, it is well-recognized by historians that the French Revolution began as protests over food prices after harvest failures sent waves of penniless refugees into the streets of Paris. Luckily, there are potential solutions — even ... in Canada. For example, at the University of Guelph we are breeding more drought-tolerant varieties of our important crops. We can promote agricultural practices that build up the soil’s organic matter. The extra organic matter acts like a sponge by trapping rainfall and holding onto it for when it is needed. In addition, we can support international development projects focusing in particular on female-headed households, to help small-scale farmers access markets and become more efficient. Focusing on women is critical because in Africa, as much as 80 per cent of food is produced by small farmers who are mostly rural women. For years, academics and activists have been trying to raise alarm bells that population growth and climate change will make it increasingly hard to maintain food security over the next generation, and that conflict is almost inevitable as a result. But until this year, there didn’t seem to be much data, outside of historic antecedents, to confirm these worries. With hunger decreasing every year, what was the big deal? But the uptick in hunger signalled in this most recent UN report should focus our attention. Of course, getting climate change under control would go a long way to reducing flooding and droughts. Part 1: 2013: Quotes. Background. Bay of Bengal incident. Decline in Canada's arctic ice cover. Part 2: 2013/2014: Canada loses its seasons. 316 North American cities to be under water. Part 3: 2013/2014: Christians, Republicans' & Democrats' beliefs differ. Volcanoes cause pauses in global warming. Americans' views on climate change. Part 4: 2014/2015: How Americans viewed climate change. HFC limits. Groups abandoning ALEC. Paris Conference reaches agreement. Part 5: 2016-FEB to AUG: Climate change concerns: Ocean levels rising. Displacement of animal species. Greenland glacier melting. "Third Pole" glaciers melting. Part 6: 2016-SEP: Flooding on the U.S. East coast. U.S. and China ratify the 2015 Paris Climate Agreement. Pres. Obama: trends are "terrifying." Part 7: 2016-SEP: Obama comments on warming (Continued). 31 countries ratify Paris agreement. Trump zigzags on Climate Change. Part 9: 2016-OCT: Did God send Hurricane Matthew as an anti-LGBT message to humanity? Alternate opinions. Hurricane Matthew re-enters Atlantic Ocean. Part 10: 2016-NOV: U.S. Costal real estate threatened. Rapid temperature rise in the Arctic. Very large poll about climate change. Part 11: 2016-DEC: President-elect Trump's climate change beliefs. New heads of federal government departments. Extinction of 11 species. Part 12: 2016-DEC: President-elect Trump's 16 promised plans on energy and the environment. Part 13: 2017-JAN: 2016 Was The Hottest Year On Record, Ever. Part 14: 2017-JAN: Recent climate change measurements. Part 15: 2017-JAN to APR: Climate Change beliefs are changing; more people accept it as real, and are now debating its cause. in Atmosphere Reaches New High. Part 17: 2017-JAN to APR: Studies of the effects of sea-level rise in California between now and the year 2100. Part 18: President Trump severs the U.S. from the Paris Accord. U.S. and world leaders react. Part 19: 2017: More Reactions to the U.S. Withdraw from the Paris Agreement. Part 20: 2017: Group of 20 summit meeting. Hurricane Harvey attacks Texas.Is climate change increasing the severity or frequency of hurricanes? Part 21: Can government regulations help? Is Harvey a message from God? U.S. record high temperatures. Hurricane Harvey attacks Texas. Hurricane Irma attacks Caribbean, FL, SC, & GA.
Part 23: All UN states have signed the Paris Agreement. Government report contradicts the President. Comment by the Union of Concerned Scientists. Part 25: 2018-JUN: A very few encouraging signs. Hurricanes slowing as winds increase. Changes in Antarctic ice and environment. Norway's growing season increased. New highest temperatures. .
Part 26: 2018-JUL Another new highest temperature. New York City reports to the UN. Impacts of humans burning up all our fossil energy. WWW.CLIMATECENTRAL.ORG's tools. Death Valley, CA, sets new record. Dissapearing wetlands in Louisiana. Climate change affecting Northern lands. Part 27: 2018-AUG & SEP: Disappearing wetlands in Louisiana Climate change affecting Northern countries. Hurricane Florence hits the Carolinas.